We might not feel comfortable talking about it, but being able to go to the toilet regularly does make a big difference. There are many factors that can cause constipation, and often a combination of poor diet, stress and lack of activity can be blamed. 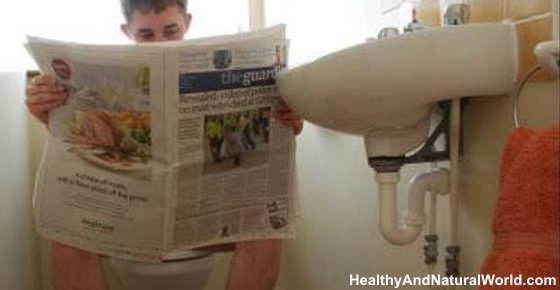 In this article I am going to explain how natural laxatives can help you relieve constipation. In their discomfort, many people quickly reach for chemical laxatives – pills, liquids, suppositories, enemas. However, when overused or misused, chemical laxatives can become a big part of the problem. Becoming reliant on a drug is never a good idea. In the case of constipation, long term use of chemical laxatives disturbs the body’s natural responses and decreases your bowels function. Before you know it, you’re gulping down pill after pill. Trying some natural laxatives first is a much better and more sustainable option. Castor oil is a safe, natural laxative. It works by increasing the movement of the intestines, helping the stool to come out. Castor oil is considered safe to ingest and the Food and Drug Administration (FDA) has stated that castor oil is “generally recognized as safe and effective for use as a stimulant laxative.” The World Health Organization (WHO) has also established that an acceptable safe daily intake for a man is up to 0.7 mg/kg body weight. For more information, read my article about the best health benefits of castor oil. Beans and legumes: Fiber-rich and low in cholesterol; you can include them in your diet to prevent constipation but if you eat too much, it could backfire and you may end up producing too much gas. Prunes: Well known as natural laxatives for constipation, prunes are also rich in vitamin A and potassium. Eat pitted prunes or drink prune juice. Flax seeds: Packed with natural fiber and omega-3 fatty acids and can be used as stimulant laxative; if you also drink enough water, they’ll absorb it and push everything out of the bowel. Flax seeds are a great addition to smoothies! Flax seeds, when eaten whole, are more likely to pass through the intestinal tract undigested, so the best way to use flax seeds is to buy whole flax seeds and grind them in a coffee grinder when you need to eat them. Nuts: Cashew nuts and walnuts are particularly good as laxatives, but other nuts will help with elimination too. Tomatoes: These antioxidant powerhouses will supply you with a good amount of dietary fiber to eliminate constipation. Cabbage: Another example of a natural and inexpensive natural laxative; it also helps to eliminate the toxins from your digestive tract and cleanses you. If you consume it in its fermented form, as sauerkraut, you’ll also provide your body with the much needed probiotics (beneficial bacteria and yeasts). Probiotics can help treat constipation and increase the frequency of pooping. Kiwifruit: A number of human clinical studies have found kiwifruit a highly effective way to provide relief from constipation and some people claim that it is the best natural laxative. Coconut water: If you can’t imagine drinking just water, coconut water is a great-tasting and healthy alternative. And, it’s very effective in relieving constipation. In fact, too much coconut water has been known to cause loose stools, so don’t overdo it. There are other 10 reasons to drink coconut water that you probably didn’t know about. When you need a quick relief, below are a few options. If the first one doesn’t work, don’t just give up. Wait 4 to 6 hours, and if there is no effect, take some more or try another one. The great thing about natural laxatives is that you know exactly what you’re putting inside your body. You can use sea salt or Epsom salt (which has other extraordinary uses). To use as a liquid laxative, simply dissolve 1- 2 teaspoons in a glass of warm water and drink it down. You can add some lemon juice to the mixture to help combat the salty flavor. After drinking the mixture, you should begin to see results within 30 minutes to 2 hours. You can buy aloe vera juice which has powerful laxative effect. But be careful, if you drink it in large quantities, aloe vera juice can cause diarrhea. For more information about aloe vera juice, including precautions and recommended intake, read my article on why you should drink aloe vera juice. Sodium bicarbonate alkalizes the body and helps the air come out of your bloated intestines. Dissolve baking soda and quickly drink the mixture. The quicker you get it down, the quicker it’ll work. To increase the health and laxative effects, you can also add some fresh lemon juice. This must be my all-time favorite. Apples are rich in dietary fiber and they also contain pectin, which helps with the bowel movement. If you want to use apple cider vinegar as a natural laxative, it’s best to drink it on an empty stomach, first thing in the morning. Mix it together and drink up. The combination of ACV and honey has many other health benefits. Drink enough water – Not drinking enough water is one of the primary causes of constipation! Eat lots of fiber – Fiber acts as a bulking agent and helps the stool move quickly through the colon. Fiber intake should be increased gradually or you may suffer cramping, bloating and gas. Make sure to read my other post on the top 12 foods to beat bloating. Increasing your fiber intake is also one of the 70 habits featured in my e-book 70 Powerful Habits For A Great Health which will guide you how to take positive steps to improve your wellness and overall health. Exercise – Exercising is a great way to stimulate your bowel movement and helps you keep regular. It also aids stress reduction. Manage your stress levels –When you’re stressed, your sympathetic nervous system takes over and produces the ‘fight-or -flight’ response, which does not support bowel movement. There are many ways to fight stress such as using these 7 meditation techniques or using these 14 natural remedies for stress. The best way to deal with constipation is to not get it in the first place – eat fiber, exercise and drink water galore! Don’t postpone your visits to the toilet. When nature calls, obey. Delaying defecation interrupts your bowel function and can lead to constipation. Avoid drinks that cause dehydration (excessive alcohol, tea and coffee). Establish a routine. If you usually do a poop in the morning, make sure you have enough time and you don’t need to rush.